In 1973 Bob Graham visited Guatemala on a Kellogg Foundation Fellowship. He was struck by the tragic circumstances endured by so many Guatemalans, especially rural Mayas. He promised himself that one day if he could, he would help people in similar situations with both resources and money. Bob grew up in a middle class Midwestern family in the U.S. After time in the U.S. Marine Corps and college, he worked in accounting and agriculture in Northern California. By 1986 Bob was restless and wanted more meaning in his work. He made a radical plan to put 50 percent of his money and 50 percent of his time into philanthropic ventures at the age of 50. He called his plan “50-50 at 50,” and later he wrote a book chronicling his adventures. He also created a family foundation named Namaste, a word honoring the spiritual traditions that Bob studied in India. Namaste means “I bow to the light in you.” Bob’s main goal was to bring out the light in each person who sought help. The first memory of Central America never left Bob and he set out to focus his efforts on this region. He was the founding pioneer of one of Central America’s first microloan NGOs, the Katalysis Partnership, which received early support from USAID. In 2004 when Bob turned Katalysis over to its regional not-for-profit partners, his microfinance work encompassed 21 NGOs in five countries with more than 200,000 borrowers and a loan portfolio of $60 million. 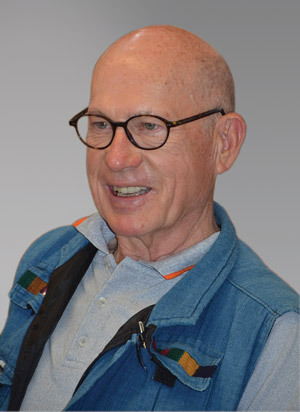 Although most of Bob’s microfinance work has been focused on Central America, he also has contributed time and money to the Eastern Caribbean, Mexico, India and Africa during the last 30 years. Over time Bob concluded that for microfinance to work best as a tool to alleviate poverty, education and mentoring on how to use the money was more effective than just loaning money. 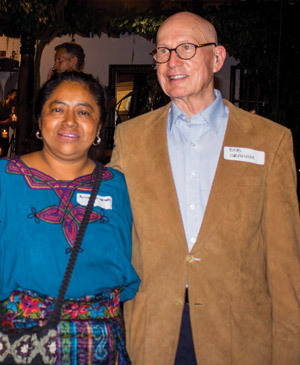 This conviction led to Bob’s most recent philanthropic venture in La Antigua Guatemala, Fundación Namaste, which offers a program of business development services (financial education, mentoring and microloans) to Guatemalan businesswomen who often earn less than minimum wages when they enter the program. Successful program graduates on average increase their income by 117 percent to help make their business dreams come true. The women’s families also benefit greatly from the increased earnings, as the extra money is spent on better nutrition, health, housing and more schooling for the children. To date, Namaste has worked with over 2,300 women. In January 2016 Bob celebrated his 80th birthday—with no signs of slowing down. When you spend time with Bob you can still feel the impatience to achieve results quicker that will meaningfully help more people become financially sustainable. Why is working in Guatemala important to you? Because the people are strong and resilient in the face of oppression, malnutrition, poor quality education and health care, polluted drinking water, astounding corruption, and unthinkable violence. Yet Guatemala is ranked in the top 10 happiest countries of the world. That surely means that despite everything, the people are determined, optimistic, and open to help. My dream is that each woman who finishes an education with Namaste feels solid about her financial abilities. It can be done. How can impactful positive change happen? The only way Guatemala is ever going to be the country it deserves to be is when its women stand up and say, ‘I am going to do something to help myself.’ I hope to provide those opportunities with Namaste. First they have to believe in the possibilities. We tell our women clients that they are worthy of a financial education, and that they are bright and capable of changing their future. If they believe that, we can help them. There are hundreds of NGOs already supporting Guatemala. What needs to happen to have a better impact? We need to figure out which NGO models are really making a positive difference, support them and scale them to more areas. To determine who is worthy of support means that NGOs need to measure the outcomes of their work at the level of positive change in the lives of the people being helped. That is how to measure success, not just by looking at money raised or number of staff. What is the future for Fundación Namaste? My long-term vision is that Namaste will be able to stand on its own two feet without me. Like another NGO I started, my dream is to turn the organization completely over to local hands. Namaste will become a sustainable NGO run by Guatemalans for Guatemalans. El miércoles 11 de noviembre, la Fundación Namasté Guatemaya celebrará su 10º aniversario con el evento “Empresas Apoyando Microempresas” que contará con la participación de más de 40 negocios locales. El evento en Nina Hotel Boutique en La Antigua incluirá degustaciones de la gastronomía exquisita de ocho restaurantes locales, así como una subasta silenciosa con una amplia gama de productos y servicios por adquirir. Esta es una excelente oportunidad de hacer compras de regalos para las fiestas de fin de año y el 100% de tus compras se destinará a apoyar la ONG Namasté. Entre los artículos que se ofrecen habrá certificados de regalo para restaurantes, masajes, manicuras, servicios de salón, tours de canopy e incluso los servicios de preparación de impuestos, además de productos como chocolate, joyas y obras de arte. Namasté es una organización que ayuda a las mujeres guatemaltecas hacer realidad sus sueños de tener pequeñas empresas, ofreciendo educación de negocios, asesoramiento y microcréditos. Durante los 10 años de la organización, ha realizado 4,100 préstamos, pero el corazón del programa es la educación y la tutoría. En promedio, las clientas tienen 41 años de edad y solo cuatro años de escuela; 24% nunca asistió a la escuela y el 26% no sabe leer ni escribir. El objetivo de las socias de Namasté es simple: ganar más dinero. Estas guatemaltecas usan casi todo el incremento en ingresos para la educación y la nutrición de sus hijos, su autoestima se eleva, y se incentivan para convertirse en líderes de sus comunidades. Namasté ha invertido US$1.37 millones en capacitación y formación y ha dado 27,500 consultas a socias individuales. Mediante el uso de una base de datos personalizada con más de 500 puntos de datos y un sistema de software de inteligencia empresarial, Namasté es capaz de seguir el progreso de cada mujer y de este modo mejorar los servicios. Puedes ayudar a que las mujeres guatemaltecas hagan realidad sus sueños empresariales. Las entradas para el evento se pueden adquirir en la oficina de Namasté, ubicada en la 2a Avenida Sur #61C, o en Cafe Condesa (MAP D4) y Rainbow Café (MAP D3). Qlik Change Our World Program Celebrates 5 Years! More than 500 data points! We feel proud to have created as excellent analytical tool that makes our work accountable. Why are analytics so important to us? We believe when data is analyzed properly, the results can help us make better business decisions to help our clients earn more income. Through the data we can determine how we are doing, where are we coming from, and where are we going. For our internal planning and operations some of our most powerful information comes from our Business Advisor Portfolio. This portfolio contains information about our active clients, how many loan cycles they have had, who is their business advisor and if each of our clients are achieving two main goals: 1) implementation of their business advisor’s advice and 2) successful business record-keeping. We can also see what percentage of our client’s income has increased or decreased! We are grateful for QlikView’s strong support since 2012. Using Prosper and QlikView together allows us to analyze not only our client’s performance but also our internal team’s performance. We have a unique data product that enables us to help more women micro-entrepreneurs make significantly more money. QlikView is rated as the number one BI software provider in the world, besting the offerings of IBM, Microsoft, Oracle, SAP, and others. The ratings are by BARC, the “holy grail of business intelligence.” Our donated technology from QlikView has a selling price of $125,000 and we have it at no cost in perpetuity. Citi Bank and Red de Instituciones de Microfinanzas de Guatemala Prize Winner 2014! Competing with over 47 microfinance organizations in Guatemala, we are excited to announce that Fundación Namaste Guatemaya has won $4,000 prize from Citi Bank and Redimif! Donor Relations Manager Karen Gonzalez attended the award ceremony and reported that Citi Bank executives shared with her that “because Namaste has such good practices, we could not pass the opportunity to give Namaste the prize.” Encouraged by this win, Namaste plans to apply for several more Citi prizes next year. “Since 2011 we are partners with Kiva, and our clients receive loans from individual lenders via the Kiva website. In order to grow and serve more clients annually, what we need is to raise more money directly for Fundación Namasté Guatemaya. With more money available Namaste can offer more women the business advising and education that is required with our loans. Another goal for 2015 is that in addition to Kiva loans, we can start our own sponsorship program directly.